Here’s a review of three documentaries that I wrote in March 2012. I thought it might be interesting to readers of this blog. As Russia has shown signs of a reawakening of its political consciousness in the last year or so, with a parallel rise in interest from the West, a number of Western-produced documentaries about contemporary Russia and its politics have been making the rounds in Europe and America and even receiving prestigious awards at prestigious film festivals. A close look at those might, however, reveal more about certain common tendencies and limitations in the perception of Russia from the outside rather than about Russia itself. Do any of these documentaries actually go beyond the image of Russia as a land of oligarchs, hunted journalists and former KGB officers who dream only of bringing back the USSR, a stereotype that so strongly dominated Western media in the last ten years? The three documentaries I intend to discuss here offer a look at three different Russias as they concentrate their gaze on three different social demographics – the globe-trotting ultra rich, the middle-class city dwellers, and the folk at the bottom of the pyramid who reside in poverty-ridden villages and small towns. 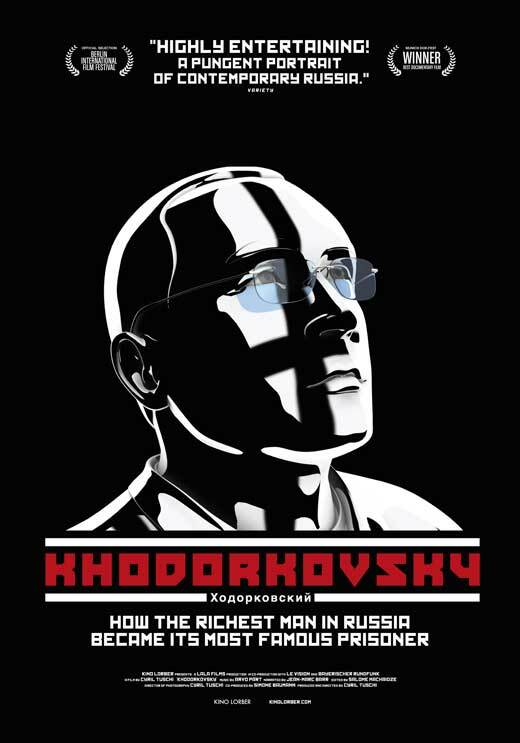 Khodorkovsky is a 2011 German film directed by Cyril Tuschi that is interested in the whys and the hows of its protagonist‘s famous case and subsequent jailing, as well as in his personality and history. It is a slick and crafty production. A lot of the time it feels like a formalist exercise with its gorgeous cinematography and clever editing. The director also does not shy away from the use of explicitly staged material (see the very first shot of the film, with a beautiful pan across a snowy landscape which ends with an exchange among young people). The use of Flash animation which keeps popping up from time to time in Khodorkovsky is undoubtedly inspired by the superb 2007 Israeli documentary animation Waltz with Bashir. However whereas the use of it is completely justified by the themes explored in the latter (traumatic experience of war, unreliability of memory, subjectivity of perception) it feels like a mere gimmick in the former, that in fact only emphasises the subjective portrayal of its hero. Especially with Cyril Tuschi himself often appearing in the shots as he documents his personal journey in search of the truth. Overall the film has a very particular feel and pace to it which is in tune with its protagonist – as the footage of Khodorkovsky himself reveals – confident, pleasant, soft-spoken and heroically calm in the face of the stupidity of Russian state and the banality of its evil. It is a pleasure to look at the film and to study its style. But what about the substance? Khodorkovsky is a very controversial figure in Russia and so are the circumstances of his rise to wealth and power. Tuschi’s film, despite briefly acknowledging this, is not interested in exploring it. In fact, almost every single person interviewed in the film is either related to him in some way (mother, first wife, son) or had been a part of his business team. The only criticism of Khodorkovksy expressed comes from his old university professor who suggests that the oligarch might not have been playing a fair game at the dawn of wild-west capitalism in Russia. This is immediately followed by Khodorkovsky’s first wife, who is sat next to him, smirking, patronisingly stroking the old man’s hand, and saying: “You can’t believe everything you hear, dear”. We, mere mortals, have no access to what was really happening between the Russian state and the then-young ambitious entrepreneurs in the 1990s, and I, probably like most viewers, have not studied the subject enough to offer alternative interpretations of Mikhail Khodorkvosky’s role in Russian modern history. However, it is difficult to ignore the limited range (somewhat of an understatement here) of such “interpreters” in Tuschi’s film. One of them, Christian Michel, introduced to us as Khodorkovsky’s business adviser in the 90s, explains the reasoning behind the government’s 1997 sale of Yukos to Khodorkovsky for a bargain price at an “auction” where he was the only buyer thus: the only people who could afford to buy the company at a world market price were foreign businesses, and it is only natural that Russian government wanted to sell it to a home-grown business. That’s nice. But it is also quite clear that other issues – why it had to be Khodorkovsky in particular, the state of competition and the dire economic situation in Russia at the time or, God forbid, the possibility of nationalised oil reserves – seem to exist completely outside of the realm of Tuschi’s film. So when it comes to Jesus-like martyr portrayal of Khodorkovsky, so typical of the Western press, a viewer as ignorant of the details of the story as myself should ask: what else are we not being told here? 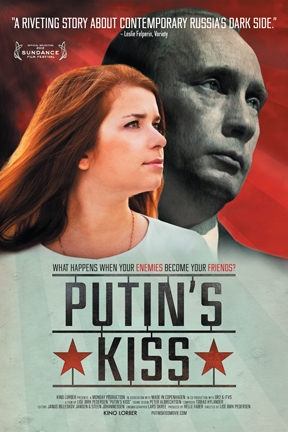 The next documentary of interest here is this year’s Danish production Putin’s Kiss, directed by Lise Birk Pedersen. The film received an award at Sundance Film Festival for its cinematography, which is indeed notable, although somewhat undermined by the film’s overwhelmingly fast-paced, almost MTV-style cutting and intrusive music. Like Khodorkovsky, Putin’s Kiss can’t help but draw attention to its style, although, in my opinion, in that regard Pedersen hasn’t got much on Tuschi. The film’s subject matter is also of less grandeur, but potentially no less interesting. It follows a young girl called Masha Drokova, who was born in Tambov and at the age of 16 joined Nashi, a pro-Kremlin youth movement, famous for targeting underprivileged provincial youths and offering them career opportunities within the organisation and beyond in exchange for political loyalty. However, Masha’s career in Nashi dwarfs anyone else’s. Suffice it to say that at the age of 19 she was already receiving some sort of award from Putin personally for her contributions to the Motherland. Her role in Nashi was primarily concerned with various types of publicity and organisation of mass gatherings so beloved by the movement. She also had her own TV spot where she would interview public figures, and it was this exposure to the world of journalism and journalists that eventually changed her life. And the Danish documentary crew was there to film it. Masha gets involved with the scene of liberal oppositional journalists, starts having doubts about Nashi and Putin, and after one of her friends, Oleg Kashin, a prominent critic of the regime, gets severely and almost fatally beaten up, she leaves the movement and never looks back. It is a great story of personal growth and the crucial role that social environments play in one’s identity, worldview and actions, and I would have loved to see more focus on this in Putin’s Kiss. Two very different and rather remarkably contrasting social circles are at the centre of the story and what a great opportunity to explore and expose the non-homogenous nature of Russian society and culture to the Western viewer. But alas, the film is not interested in any of it. It is, however, interested in over-dramatising minor events in the story and in aggressive use of music and montage to convey the evil nature of Putin’s regime, as well as reinforcing every stereotype in the book about contemporary Russia on the way. You only have to look at the film’s promotional poster, with its early-Soviet-style imagery and font, to see what I mean. The film has a masterful trailer, by the way. Kudos for that. The two films discussed above are in stark contrast to Eline Flipse’s Our Newspaper, a lesser known film with nowhere near as much promotion and exposure, which is a genuine shame. 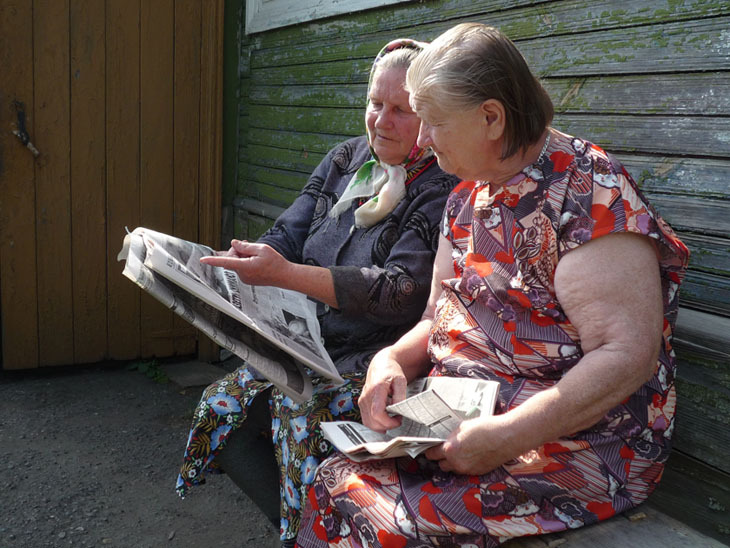 This 2010 Dutch documentary is a gentle and sensitive look at life and the difficult survival of independent journalism in provincial Russia, the rural area around Vladimir Lenin’s birthplace, a town called Ulyanovsk. The film follows Andrey Shkolny, the editor of Our Newspaper (Наша газета), a local publication supported and driven entirely by him and his wife. Their paper reports minor local news (water gets frozen in the pipes leaving communities without showers for weeks, a drunken fight occurs in the nearby village, a local factory pollutes a river killing the fish and making a number of people ill), contains horoscopes taken from the internet and gets distributed by the couple around the area in their old car. Our Newspaper competes with a government-sponsored paper and its ever-cheery news, which continuously tries to put pressure and Shkolny and put him out of business, although there is no doubt that Our Newspaper holds a special place in the hearts of the readers. The best thing about Eline Flipse’s film is that it isn’t just about the struggle of individual against the state, or the repression of free speech (although it is about that too), but the fact that she puts all of this in the context of everyday existence, and by that avoids the oversimplification and black or white discourse which is so strong in Khodorkovsky and Putin’s Kiss. It also lacks the aggressive formalism of the other two as most of the time, Flipse just lets the camera roll, capturing the atmosphere and the pace of rural Russia. Her editing is gentle and her choice of shots never emphasises the decay and deprivation of the area, nor does it make us feel desperately sorry for the people who live there by using tearjerking close-ups of old people’s eyes with sad music over it. Flipse never takes away the people’s dignity and does not manipulate our perception of them, which is a rarity in this genre of documentary. The result is an effective and clever film, which makes a complex and powerful point about contemporary Russia and the state of politics in it. I highly recommend to seek it out and spread the good word. Russia needs and deserves more of the Western audiences to be exposed to documentaries like Our Newspaper. — wow, that’s a bit hypocritical, don’t you think? Well, given the last year was marked with the clear shift to isolationism, clericalism, and quite nasty repressions, the words “reawakening of political consciousness” sound like you’re supporting all those ‘wise’ decisions. Eh, I’m not equating ‘Russia’ with Russian governement. I am talking about the rise of political consciousness among Russian people and the spread of the oppositional movement. I’m sorry if this is not clear enough. Maybe it’s worth reading the rest of the article before making assumptions about what I support and what I don’t. Oh, sorry, misunderstood you. But, indeed, “Russian people” instead of “Russia” would sound more clear. I will, however, not change ‘Russia’ to ‘Russian people’, because I think that equating Russia with Russian government is precisely at the heart of the problem when it comes to the Western perception of the country.